Construction workers soared above Temple B’nai Israel’s new synagogue, under construction on Easton Parkway, on the V-shaped, raised roof “monitor” that shelters the portion of the sanctuary that houses the ark on the east side of the building. Photo Credit: Connie Connolly EASTON — Temple B’nai Israel will be celebrating two upcoming holidays in the church that has hosted significant events in the life of the local Jewish congregation for years. This year, Rosh Hashanah and Yom Kippur will be observed at St. Mark’s United Methodist Church in Easton. But next year, these high holy days will be celebrated in the new synagogue under construction on Easton Parkway. Rosh Hashanah, the Jewish New Year, will be celebrated at 7:30 p.m. Wednesday and 10 a.m. Thursday, Sept. 21, at St. Mark’s UMC, 100 Peachblossom Road in Easton. Yom Kippur, the Day of Atonement, will be observed at 7:30 p.m. on Friday, Sept. 29, and Saturday, Sept. 30, at St. Mark’s UMC. Construction for the new 9,400-square-foot synagogue and Satell Center for Jewish Life on the Eastern Shore began officially with a June 4 groundbreaking ceremony. Hyman is planning on a formal consecration of the sanctuary and dedication of the building in June 2018. “It will mark a major event in the life of the Jewish community and the larger community as well,” Hyman said. Willow Construction of Easton is building the new temple, located at the corner of Tristan Drive and Easton Parkway in Easton. For the occasion, members of the congregation will march the Torah scrolls from the old building at 101 West Earle Ave. to the new temple at Tristan Drive and Easton Parkway, a journey of nearly two miles. “It will be a first for everybody in the congregation,” Hyman said. The synagogue was founded in 1951 and has more than 200 members. 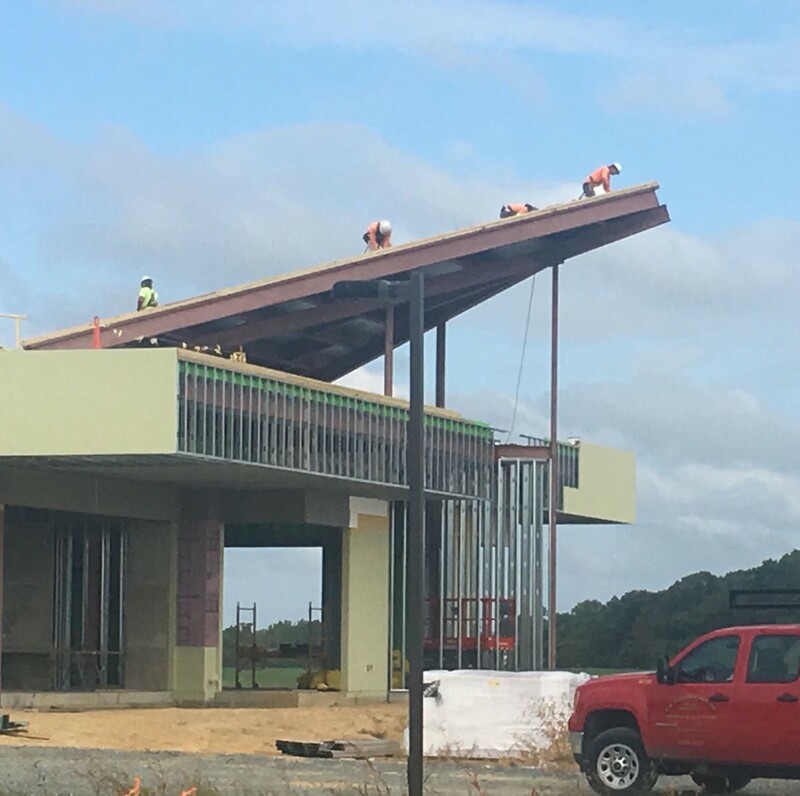 On the new building, a V-shaped, raised roof “monitor” that soars above the clear story on the east side of the building is being completed. It shelters the portion of the sanctuary that houses the ark and toward which the congregation faces during worship. The high window beneath the monitor will be tinted with a decorative film in shades of blue and white signifying the sky and the heavens, project architect George Fowler said. He’s with Levin/Brown Architects in Baltimore which specializes in liturgical building design. Principal architect for the project is Jay Brown with Levin/Brown Architects. Follow me on Twitter @connie_stardem.